Meowee furiends, it has been quite awhile since I’ve been around. 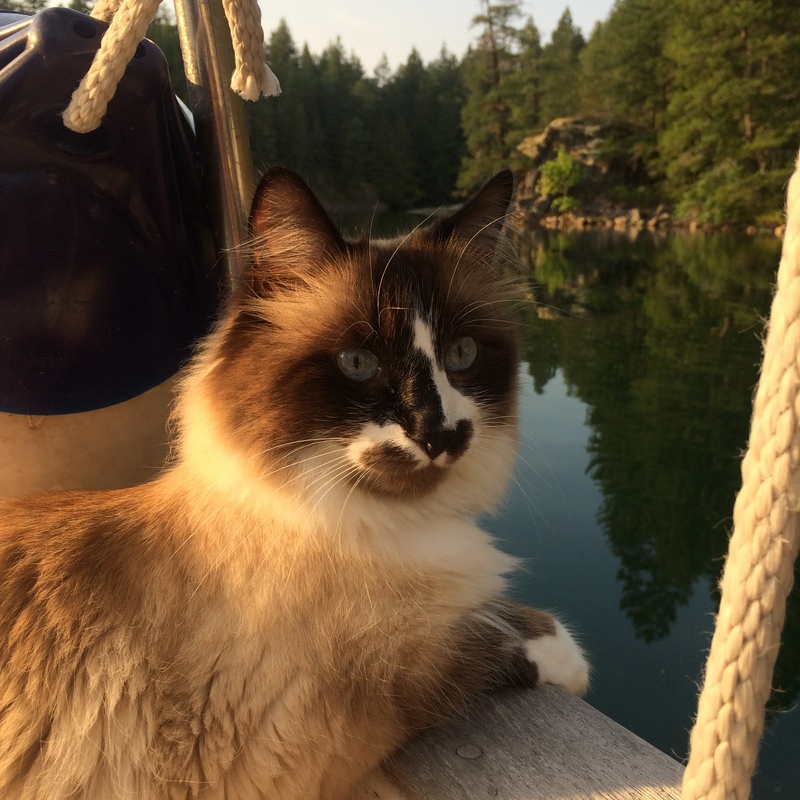 I could blame it on my humans for all their problems: for them getting married, for him losing his job so she had to get a second job, then him eventually getting another job, to her becoming commander of our boating group and for all that demands of her, and for all the repairs needed around our land shelter and boat. Oh my, I let a lot of cats out of the bag according to to my humans. Instead, let’s just say, we had to put our boating and cute cat tricks aside until the humans landed back on their feet. Now that I’m back, I will update you on all that. The worst problem was Minstrel’s fuel tank leak last summer that pretty much shut down our boating season. Yep they (the marina) put a boom around her to contain and soak up the escaped diesel fuel. Luckily insurance paid for the clean up. Let me tell you, repairing a leaky fuel tank is not easy. However I won’t tell you about it today as today I wanted to tell you that today we left the marina and set out on our 2 week adventure at sea. Like I said, Meowee! Meow-woe is more like it. I had been down to our boat Minstrel several times this spring, either just staying at the dock overnight, or at a nearby bay about 30 mins away. So ya’d think me sea legs would be a bit sturdier, however, we had to stop to lend a mariner hand to a fellow boater about 2 hours into our travel time, which required us to stop. We may have stopped, but the ocean didn’t, and the waves tossed us up and about at random. That’s when I lost it, my lunch that is. Truth be told, it wasn’t that bad actually. It was a beautifully hot and sunny day, and save for the wakes of a too close Sea-ray (boat), the waves were only a reflection of the traffic on it and not the wind. Many boaters were taking advantage of the fair weather and vacationing the waters of our shoreline in their floating RVs. Our usual stopover at Garden Bay is a popular location for our members. This is the official kickoff to our squadron’s Northern Cruise, and my human Dave is the cruise co-ordinator for it this year. He’s supposed to pick the destinations and plan activities for the other members to enjoy. We’ll cover that over the next 2 weeks.. But back to today. Mildly entertaining, but do you remember when I introduced you to Nacho, my furiend from Mexico? Well, Nacho’s human had him on her lap on the dock, so my human thought she’d like to do the same with me, close to them. Aside from a faint growl and a hiss here and there later, the humans thought it was a successful meet n greet but soon after I had had enough and headed back to Minstrel. 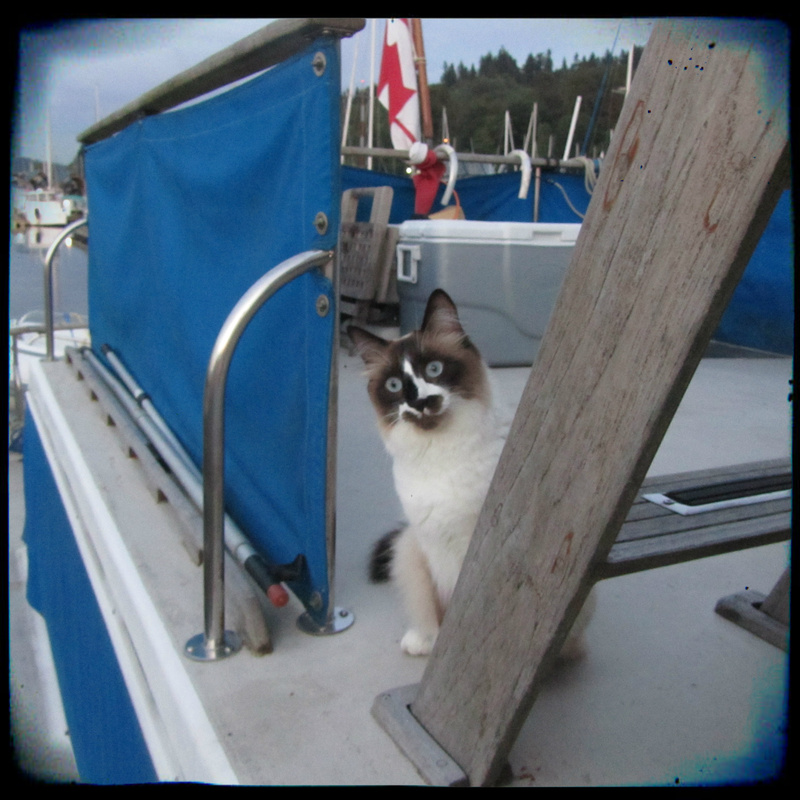 I got to thinking that I may have been a bit rude to Nacho by leaving so abruptly, so later when I saw him across the dock on his boat, it seemed like a purrfect oppurrtunity to make amends. Off Minstrel and down the dock I went to jump onto his boat, Sea Haven. Don’t ask my why I changed my mind in mid jump, but I did and fell right down into the drink below. I wasn’t there long as I clawed my way up the wood siding of the dock and out of the wet, but wet I did get anyways. My human had noticed my actions and thought to follow and get a photo or two, but rescuing me and keeping my wet sorry self off their bed was her first priority, and I was promptly put in the shower for a fresh water rinse before a brisk towel dry. After that I was left to air dry on my own. Amends will have to wait for another time. And so that ends our time today. What could possibly happen tomorrow? Meet my new furiends Pen and Guin. We were all set to go to the annual Penguin Plunge event on New Years Day this year and then found out it got cancelled. Apparently on New Years Eve day, a boat with a wooden hull had sprung a leak and started sinking. The skipper decided to head for shallower waters so it wouldn’t sink very deep. Unfortunately that was the boat launch at Rocky Point Park here in Port Moody where hundreds of humans gather to take a traditional dip in the frigid sea water to start the new year. We were all very disappointed, and instead of spending a very beautiful but cold and somewhat foggy day on the water with the other silly humans wearing silly penguin hats, we spent most of the day in our land home, doing nothing. We could have gone to another Penguin Plunge event that was scheduled a couple of hours later in another community about twenty minutes away by boat, but Minstrel has recently developed a mysterious electrical problem and unless the generator is running, we have no power coming into the boat. The generator is louder inside the boat than out, and that was the last thing we needed to hear after a late night of “ringing in” the new year. Pen and Guin usually stay outside the house in their light-up hot air balloon during the Christmas season, but before they left to go back to their home at the south pole, I took advantage of a rare indoor moment to get a selfie with them. They’ll be back again next December. 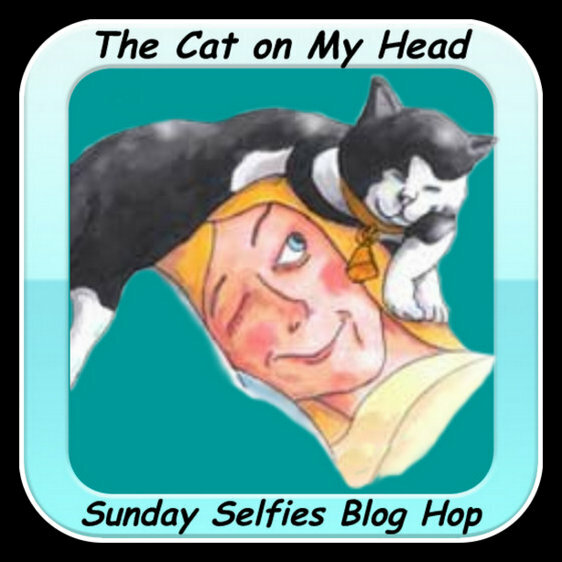 We are joining THE CAT ON MY HEAD for the first Sunday Selfies of 2016.Click here to see more selfies, and join the fun! Poetry 101 Day 9: As temperatures begin to drop in the Northern Hemisphere, let’s focus our attention today on “cold,” and whatever that word evokes in you. Write a poem that will send chills down our spines (literally or not). Our form was to be a concrete poem but I changed it to a Blitz Poem, a poetry form created by Robert Keim. This form of poetry is a stream of short phrases and images with repetition and rapid flow. There should be no punctuation. When reading a BLITZ, it is read very quickly, pausing only to breathe. Find out more about it at Shadow Poetry. The device is anaphora/epistrophe which coincidentally is part of this form by design. Anaphora simply means the repetition of the same word (or cluster of words) at the beginning of multiple lines of verse in the same poem. Epistrophe is its counterpart: the repeated words appear at the end of lines. Like most simple devices, though, the trick is in deploying them to their full effect. Repetition lends emphasis to words, adds weight, and leaves a deeper imprint in your readers’ memories. Photo of meow and my humans, taken by my furiend Tank’s human, Sharee Bourke. This is a blog hop. Click the badges below to see more and join the fun! This photo was of me sitting on top of the settee cushion at window level on our boat Minstrel as we were leaving our marina, but the background scene in the window was of an ugly oil refinery, so we were very pleased with how a little cropping and a couple of photo effect apps totally blotted that aspect out. 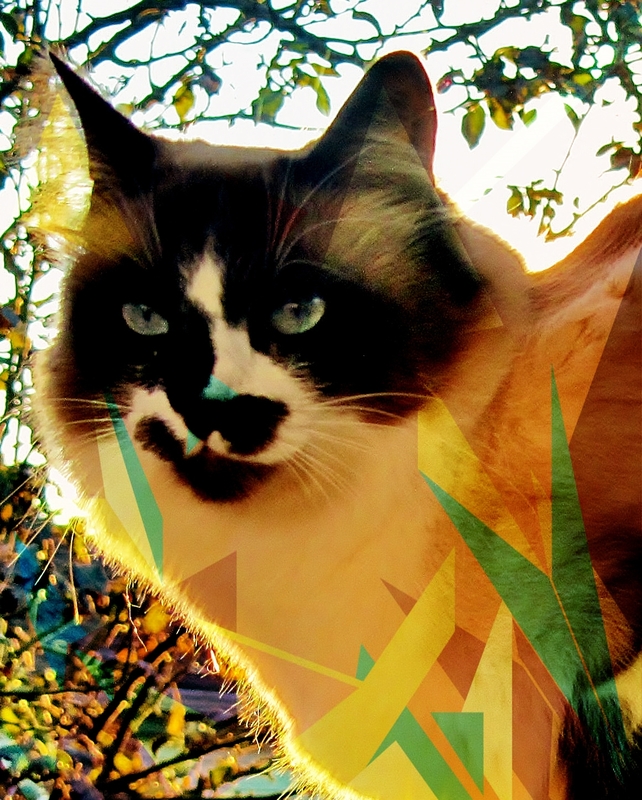 First we uploaded the iphone photo into PHO.TO and selected the Realistic Photomontage-> Catoptromancy effect. It needed a bit of a frame finish so then we uploaded it Pixlr.com and applied the Wave effect and Tiny Frame. And I couldn’t resist a quick Halloween Haiku to go with it. 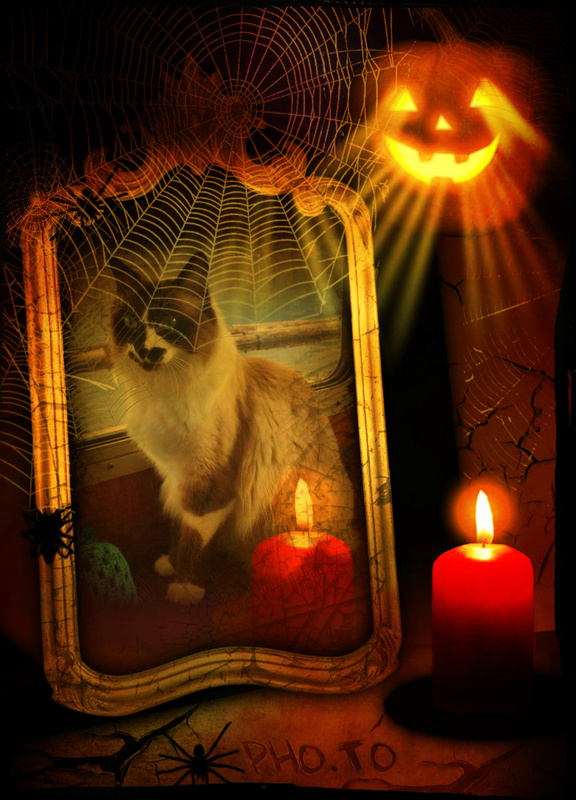 Happy Halloween 2015!! 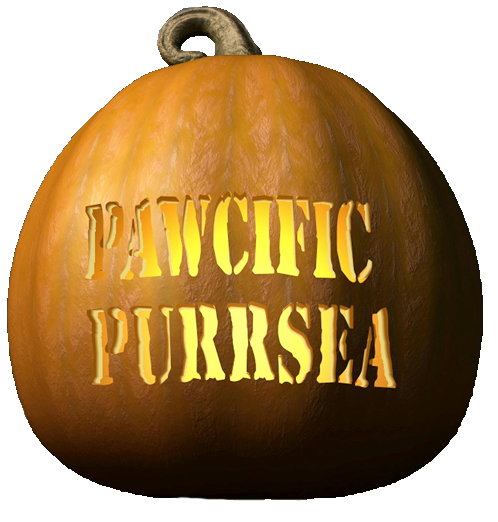 A shout out in honour of Penelope, The Cat From Hell who designed this pumpkin for me last year! Click here to see more and join in the fun! What is a face, really? and it’s always in your face. My human always comments that my face is like a Picasso face, so what’s a more appropriate subject for this found poem of some quotes by Pablo Picasso, mixed in with instructions she found on how to draw your own Picasso face. Poetry 101 Day 6: Before we learn how to read words, we learn, intuitively, to read faces. In today’s poem, take a single face or a multitude of them as your point of departure. It doesn’t even have to be a real-life, flesh-and-blood face you’re writing about. A found poem is composed of words and letters you’ve collected — randomly or not — from other sources, whether printed, handwritten, or digital, and then (re)arranged into something meaningful. Today’s device: chiasmus. At its simplest, a chiasmus is essentially a reversal, an inverted crossing.Chiasmus is effective in poems because it’s a form of repetition — and by now we all now how crucial repetition is for poetry. The magic of instant effect generators takes a ho-hum or flawed photo and transforms it into something unexpected and unusual. What I like about these types of apps is that at each tap of your pad (or human finger), effects, overlays and borders randomly apply themselves. Instantly. Right on your phone. Meowee, over 2 million possible combinations can make it a real challenge to like just one. So for Sally’s Mobile Photography Challenge this week, we used the same photo with two different outcomes. 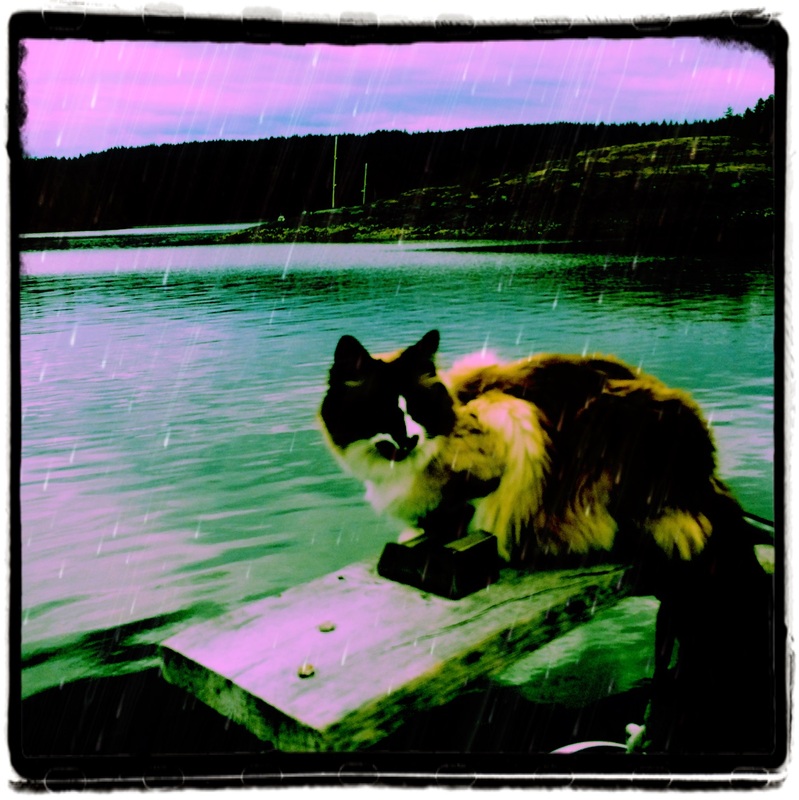 There are several apps that do this but the one we’ve been using is called Pixlr-o-matic, and is free to download to your iPhone, and probably Android too but we don’t use them to know fur shore. Hipstamatic is another as is Snapseed. I must have tapped about a hundred times until I decided on the looks I liked best for this photo. You can also makes minor tweaks to change any element of the combo. 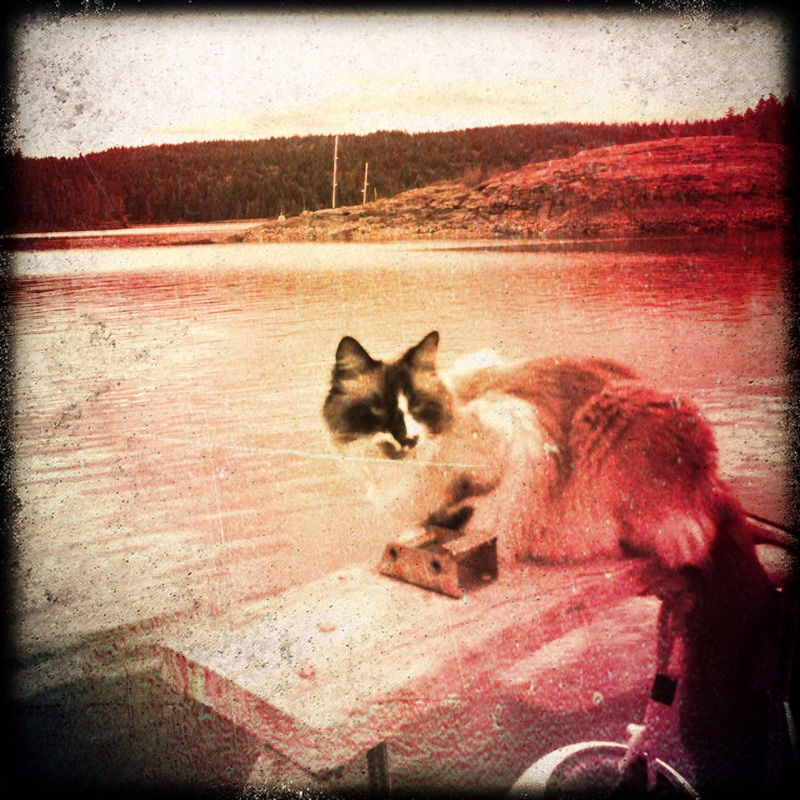 This ho-hum photo is of meow sitting on the stern rail where the prawn puller gets attached. I was trying to give the humans a hint. Turns out i didn’t have to try too hard; they managed to haul up almost 500 of them overall this cruise. 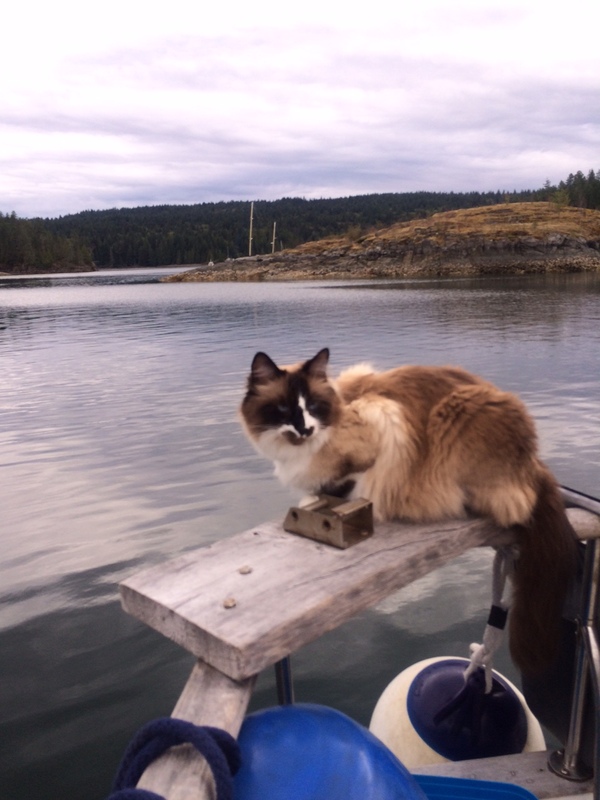 Behind me is doggy-doo island in Squirrel Cove on Cortes Island that the humans took me to play on. As my nickname for it implied you had to be careful where you stepped and that didn’t impress meow much, and I just wanted to go back to Minstrel. The camera focused more on the island than meow so I’m a little blurry. A little insta-magic editing made the save. In the first photo, the effect is called “Greg“. All the effects have people’s names and they are supposed to set the mood of the photo. The overlay is called “Rain“. It was actually was raining that day. Thirdly the frame is called “Sloppy“. The result? Kind of a pop artish look don’t you think? For the next photo, a few more taps and we have the “Lucas” effect, “Morning” overlay, and “Sand” frame. Seems to give it a bit of a washed out retro feel. So many looks, so little time. What phone photo editing apps are you using?